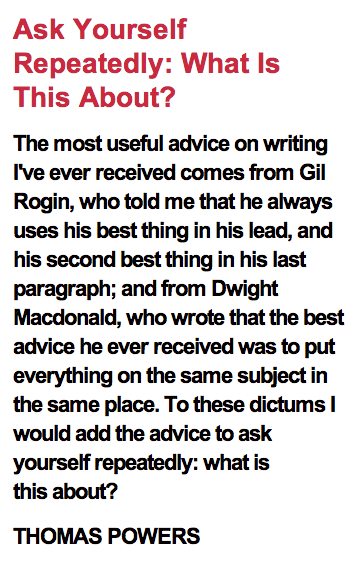 Jon Winokur doles out terrific writing counsel on his aptly named website, Advice To Writers. This one popped up today and knocked my socks off. It seems so simple, right? 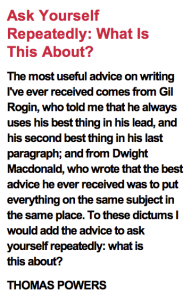 If you’re writing something, know what you’re writing about. Thing is, sometimes I forget that. In editing a short piece for Travelati recently, I found myself asking that exact same question. What’s the story here? Our little editorial team, who works for coffee and the love of the craft, batted it around a bit, then we nailed it. It’s a wonderful story of someone who’d traveled far to do something amazing, but what she really wanted was to go home, to be with her babies. Bam! Suddenly it fell into place, a story we can all connect with, doing one thing (no matter how amazing) when all we really want is to be somewhere else. Read the next edition of Travelati and you’ll identify with her too.